Frey is the captain of the Ketty Jay, leader of a small and highly dysfunctional band of layabouts. An inveterate womaniser and rogue, he and his gang make a living on the wrong side of the law, avoiding the heavily armed flying frigates of the Coalition Navy. With their trio of ragged fighter craft, they run contraband, rob airships and generally make a nuisance of themselves. So a hot tip on a cargo freighter loaded with valuables seems like a great prospect for an easy heist and a fast buck. Until the heist goes wrong, and the freighter explodes. Suddenly Frey isn't just a nuisance anymore - he's public enemy number one, with the Coalition Navy on his tail and contractors hired to take him down. But Frey knows something they don't. That freighter was rigged to blow, and Frey has been framed to take the fall. If he wants to prove it, he's going to have to catch the real culprit. He must face liars and lovers, dogfights and gunfights, Dukes and daemons. It's going to take all his criminal talents to prove he's not the criminal they think he is . . .
Retribution Falls (book #1 of the Ketty Jay series) is fantasy with a few SF elements to it, which is quite adventurous reading for me (I don’t usually wander far outside of sword and sorcery/medieval-type fantasy). I think the fact that it was different really helped my enjoyment of it, as I’ve found a lot of the ‘traditional’ fantasy I’ve been reading has started to feel a little stale. I read a lot of this book on my commute to and from work, and other books I’ve read recently have suffered for this, partly because the structure of the story doesn’t stand up to being read in little chunks. 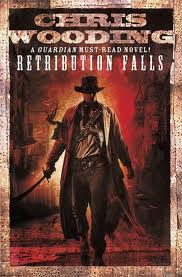 Retribution Falls was actually great for this kind of reading: the characters spend a lot of time hopping from place to place, never doing any one thing for too long, and as such there are lots of short sequences and well-structured chapters that made it easy to just pick up the book and carry on from where I left off. The characters were a bit hit and miss for me, and I didn’t feel like I engaged with them as much as I’d hoped too. 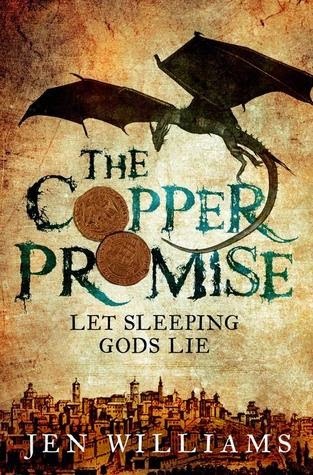 I’d pretty much expected ‘Locke Lamora on an airship’, so it’s no wonder Wooding’s characters didn’t quite live up to my expectations (then again, even the last Scott Lynch book didn’t live up to my expectations, so maybe the problem lies with me . . .). The main character here, airship captain and smuggler Darian Frey, is likeable enough, but not quite as roguish or interesting as the blurb suggests, and I actually found myself more invested in the secondary characters, mainly Crake and Jez, than in Frey. Even they didn’t feel fleshed-out enough, though. I think all the characters were lacking depth in one way or another: it felt to me like I was playing an RPG, and the characters were ‘companions’ who eventually revealed something about themselves depending on what you said to them. I also found it highly unbelievable that Frey had spent so much time with these characters before the events of the book, yet was only now starting to care about them enough to take an interest in them. Criticism aside, I enjoyed reading the book, and am looking forward to getting hold of the second one in the series sooner rather than later. Lord Regent Geder Palliako's war has led his nation and the priests of the spider goddess to victory after victory. No power has withstood him, except for the heart of the one woman he desires. As the violence builds and the cracks in his rule begin to show, he will risk everything to gain her love or else her destruction. The Widow’s House is the fourth – and penultimate – book in Daniel Abraham’s awesome fantasy series The Dagger and the Coin, and continues to follow the stories of four central characters during their nation’s descent into war. 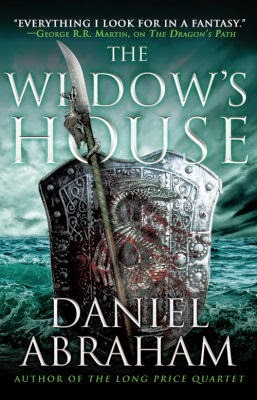 As with the previous three books in the series, The Widow’s House is very character-focused and is structured using the named chapters and switching POVs popularised by George RR Martin. As with all books that use this technique this is sometimes quite frustrating, particularly when a chapter ends on a cliffhanger, or when you’ve forgotten what a certain character was doing when last we saw them. However, it’s nice that the focus has consistently been on the same four POV characters throughout the series, and picking up The Widow’s House gave me the sense of being reunited with old friends. The switching POVs also become much less disorienting as the novel progresses and each of the different storylines all begin to fall together. Much as I like all four of the main characters, I have to say that once again Geder Palliako edges in front as my favourite. The Lord Regent is child-like and peevish, petulant and bitter, and yet strangely sympathetic. He’s the nicest of people while at the same time being the villain of the piece, a tyrant who simply does not realise he’s a tyrant. He fails to observe that everyone is terrified of him and his inexplicable rages, and is instead desperate for everyone to be his friend. He doesn’t realise certain things are inappropriate, such as staying over for a week to personally oversee his Lord Marshal’s wife giving birth, or committing entire armies to devastating battles simply to take revenge on a woman who hurt his feelings. He also doesn’t realise that he is a puppet, manipulated by his most trusted friend – the spider priest Basrahip – into turning his kingdom into a platform for the chaotic cult of the spider goddess. The other characters are very different, but also likeable and interesting to read about, and all three are working together – whether knowingly or not – towards the same end. The darling of the piece has to be Clara – the ‘widow’ in The Widow’s House – who is secretly scheming to overthrow the Regent in order to protect the kingdom, a job made much more complicated by the fact that her husband was executed by Palliako for treason, and she is unwilling to jeopardise her sons, both of whom hold high positions within the Regent’s army. Clara is brave, practical and loyal, and her chapters always make for a pleasantly easy read (despite the fact that not a lot really happens in them). In contrast, Marcus is a cynical mercenary who has travelled to the ends of the earth searching for ancient weapons to stop the spider priests from spreading their evil; while Cithrin, a banker, is attempting to undermine the Regent and his priests using more unconventional means. Cithrin’s chapters are often the most interesting: she is the ‘coin’ in The Dagger and the Coin, and is forced to find ways to defeat her enemies using the resources at her disposal, namely money. This thread of the story, focusing on economics rather than war or politics, is original and interesting, although a little under-used. All of the characters have developed throughout the series in their own fascinating way, and the plot has progressed to the point where I can’t wait to see how it ends. Bring on book five! It began with rumors from China about another pandemic. Then the cases started to multiply and what had looked like the stirrings of a criminal underclass, even the beginnings of a revolution, soon revealed itself to be much, much worse. Faced with a future of mindless, man-eating horror, humanity was forced to accept the logic of world government and face events that tested our sanity and our sense of reality. 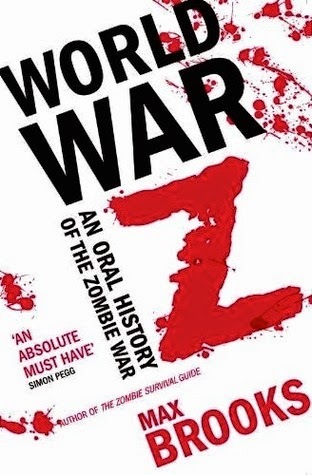 Not everyone realises at first that the full title of this book is World War Z: An Oral History of the Zombie War. And so many people are surprised, and even disappointed, that the format of the book is set out exactly so: like an oral history. World War Z is written as a series of interviews with survivors from all over the world: soldiers, housewives, children, mercenaries, from India, America, China, Korea . . . The format really lends itself to the faux-factual tone of the book, and once you’ve accustomed yourself to reading a ‘history’ rather than a novel, you start to realise its brilliance. Although the book is built from lots of seemingly disparate accounts, it is organised chronologically into rough chapters such as ‘Warnings’, ‘The Great Panic’ and ‘Turning the Tide’, all of which outline major stages of the war. Despite the fragmentary format World War Z ultimately still tells a story, and the various survivors' accounts are arranged into a narrative with a distinctive beginning, middle and end. The chapters and accounts depict the course of the zombie war, from the initial outbreak and speculation over its cause, to the inevitable spread of the undead infection through the mediums of immigration and organ transplants, to the ‘Great Panic’ and mass evacuations, to the eventual reclaiming of the planet from the zombie infestation. The oral accounts are told from many different perspectives and ‘voices’, and this paints a picture of how differently certain people and parts of the world were not only affected, but how they chose to deal with the situation, most of which are probably frighteningly accurate predictions. Many of the accounts focus on relaying the political and economic impact of the apocalypse on various nations, and some of these do occasionally become a little dry. However, they serve to add to the overall atmosphere of realism; and they’re often sandwiched between much more exciting accounts, the tone and content of which vary between horrific, hilarious and heart-wrenching. Some of the highlights are the retired handler from the army’s canine unit; the introverted teenager forced out of his cyberspace haven and into the harsh reality of a Japan overrun by undead; the plucky fighter pilot stranded in the heavily-infested Louisiana swamps and guided to safety by a mysteriously anonymous ‘Skywatcher’; and the Chinese crew of a nuclear submarine fighting to stay alive after spending years of the war on the bottom of the ocean. Each of the stories are unique, and Brooks has really excelled himself in imagining just how the apocalypse would affect different classes of people from literally all over the world. While a lot of the fictional accounts are focused on the ‘facts’ of the war, they nonetheless create vivid images that stick in the mind. Like the few hundred army troops facing a million-strong zombie horde across a deserted plain to the soundtrack of Iron Maiden’s ‘The Trooper’; like the refugees sheltering in safety on beaches and tropical islands only to have shambling corpses emerge without warning from the sea; and like the French forces trapped in the catacombs beneath the city of Paris, with hardly any working torches or weapons, trying to stay ahead of an enemy they can barely even see in the dark, flooded tunnels. World War Z is terrifying, entertaining, and most of all, it will have you believing that the zombie apocalypse actually happened . . . or could happen . . . The Adamantine Palace lies at the centre of an empire that grew out of ashes. Once dragons ruled the world and man was little more than prey. Then a way of subduing the dragons through alchemy was discovered and now the dragons are bred to be mere mounts for knights and highly valued tokens in the diplomatic power-players that underpin the rule of the competing aristocratic houses. The Empire has grown fat. And now one man wants it for himself. A man prepared to poison the king just as he has poisoned his own father. A man prepared to murder his own lover and then bed her daughter. A man fit to be king? But unknown to him there are flames on the way. A single dragon has gone missing. And even one dragon on the loose, unsubdued and returned to its full intelligence, its full fury, could spell disaster for the Empire. I was a little sceptical going into The Adamantine Palace, largely because it’s hard to believe that a fantasy series about dragons is capable of doing anything that hasn’t already been done a hundred times. 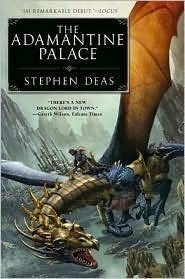 However, the first book in Deas’ Memory of Flames series has piqued my interest, not least because of the way it combines elements of traditional fantasy (dragons, dragon-riders, alchemists and magic) with the subtler sorts of features that define modern fantasy (court intrigue, power plays and political manoeuvring). The author’s heavy focus on the former and deft weaving of the latter gives The Adamantine Palace the feel of Dragonlance meets Game of Thrones. The story is a little slow to get going, and I have to say it took me a large part of the book before I really began to take an interest in the characters. There are so many different POV chapters initially that it’s hard to figure out who we’re supposed to be emotionally investing ourselves in, and not all of them are developed quite as much as they perhaps could be. However, there were some characters whose segments I thoroughly enjoyed reading, particularly those of the book’s main antagonist, Prince Jehal. The chapters showing the thoughts of the dragon as she gradually begins to recover her memories are also interesting, and it would be nice to see more of these in future books. Much as I enjoyed the chapters about the dragons in the wilderness, my favourite parts of the story were those focusing on the power struggle between Shezira and Jehal. I found the political intrigue very, well, intriguing, at least once I’d got to know all the players, and trying to guess different characters’ plots and motivations was a lot of fun. By the end of the novel the politics reach fairly convoluted levels of backstabbing and betrayal, and the author really had me turning the pages towards the end to find out who was going to come out on top. It’s not quite GRRM-level stuff, at least not yet, but it definitely has the potential to become just as interesting, and I’m certainly looking forward to getting hold of the next book in the series. 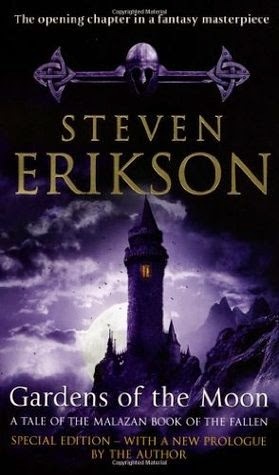 The vast Malazan Empire simmers with discontent, its subject states bled dry by interminable warfare and clashes with Anomander Rake, Lord of Moon's Spawn, and the mysterious Tiste Andii. Even the imperial legions, long inured to the bloodshed, yearn for some respite. Yet the Empress' rule remains absolute, enforced by her dread Claw assassins. Gardens of the Moon is the first in a series that you will inevitably either love and worship, or hate and resent, or possibly simply give up on before reaching the end of book one. 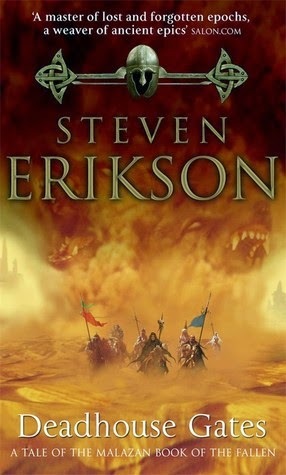 The first instalment of The Malazan Book of the Fallen introduces a hugely diverse and seemingly endless cast of new characters: mages and soldiers, humans and not-quite-humans, demon lords and talking ravens, gods and nobodies, heroes and villains and others occupying the grey space in between. There are several strands of the story occurring at once – huge-scale campaigns, deadly assassin wars, magical battles, political manoeuvring, covert missions – and not all of them appear to fit together very well, at least at first. It’s a lot to take in, and the first three hundred pages or so are enough to leave any first-time readers as lost and helpless as a puppet with its strings cut. In the prologue to the newer editions Erikson himself states that he refuses to spoon-feed his readers, and finds it insulting and patronising when other writers do the same. His decision to withhold important backstory and omit dreary exposition is a conscious and tactical choice, and he is fully aware that Gardens of the Moon is likely to leave readers floundering. However, he writes with the assumption that those who choose to read his work don’t mind floundering a little, don’t mind having to work things out for ourselves, and don’t mind waiting many hours and thousands of pages before the pieces finally begin to fit together. As someone who has read all ten books in this series I can unequivocally state that finally experiencing the moment(s) when everything starts to make sense makes ploughing through the confusion at the beginning so worthwhile. The series contains so many ‘ohhhh, so that’s what that was about!’ moments that the rewards of reading well outweigh the challenges. That said, it’s only upon re-reading Gardens of the Moon and the rest that you really begin to appreciate the amount of planning and detail that’s gone into this series. There are so many tiny nuances that take on a double meaning, so much of the dialogue that becomes multi-layered, and so many little things that you didn’t notice the first time but are steeped in pathos now that you’re fully aware of the events to follow. As a debut novel Gardens of the Moon is insanely dense and ambitious, but it’s also incredibly clever and well-executed. Recently finishing Half a King has given me a craving for re-visiting the other works of one of my favourite fantasy authors of all time. 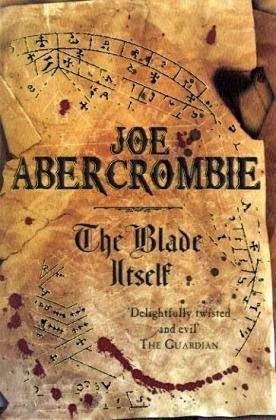 Joe Abercrombie’s First Law trilogy was my first real introduction into the world of modern fantasy; when I first read The Blade Itself several years ago the only other fantasy authors I’d read much of were Tolkien and Feist, both of whom write far more ‘traditional’ fantasy, and I revelled in Abercrombie’s refreshing writing style during this re-read as much as I did when experiencing it for the first time. The language is forthright and sparing, the tone is dark and dry, the action is bloody and grim, and the humour is often laugh-out-loud hilarious. There are so many brilliant lines and moments of bathos (the First of the Magi storming out from the bathroom springs to mind), enough that you can’t help but admire not only Abercrombie’s ability to write but also his imagination’s seemingly endless supply of amusing situations and dry witticisms. The Blade Itself introduces two of the best fictional characters ever created: Logen Ninefingers and Sand dan Glokta. Both are very cynical, both are very realistic, and both are very, very different. Glokta is a cripple and member of the Inquisition, a former soldier who was tortured for years in an enemy prison camp and now does the same to others for a living; while Logen is the leader of a group of grizzled Northmen, a band of barbarians cast out from their tribes and wandering the lands beyond the mountains. The other characters – Ferro, Dogman, Jezal – are also very entertaining to read, and all have their own unique voice that comes across brilliantly on the page. Abercrombie really captures the essence of his characters: Jezal’s self-centredness, Logen’s practicality, Glokta’s sneering cynicism – and despite the switching POV’s I never once experienced the ‘internal sigh’ such as when beginning a paragraph about a ‘meh’ character (a bit like a ‘Bran’ or ‘Catlyn’ chapter in ASoIaF). For all that, though, I have to say that not an awful lot really happens in the book – it pretty much functions as an introduction to the characters and a set-up for the next book. However, it’s easy to overlook this most of the time as the character-focused narrative keeps it ticking along nicely, and some of the internal monologues – particularly those of Logen and Glokta – are so entertaining that you can forgive the story for being a little slow in places. You also have to remind yourself that it’s the author’s debut novel, and any minor flaws are guaranteed to be ironed out in future works; as Logen would say, you have to be realistic about these things, after all.